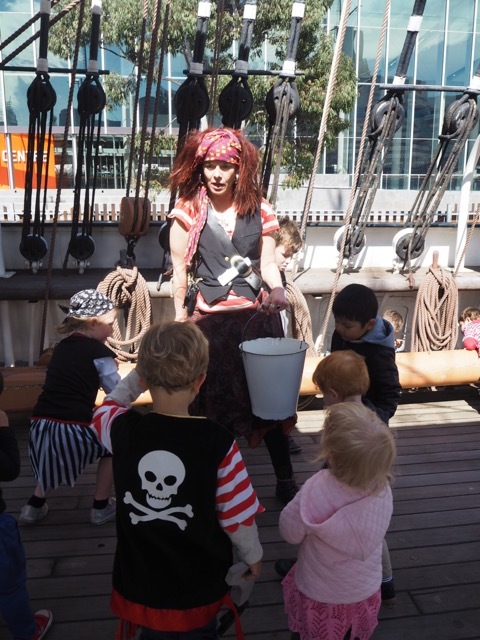 Kate and her little pirates had a fantastic day being scallywags onboard the Polly Woodside on Pirate Sunday last weekend. 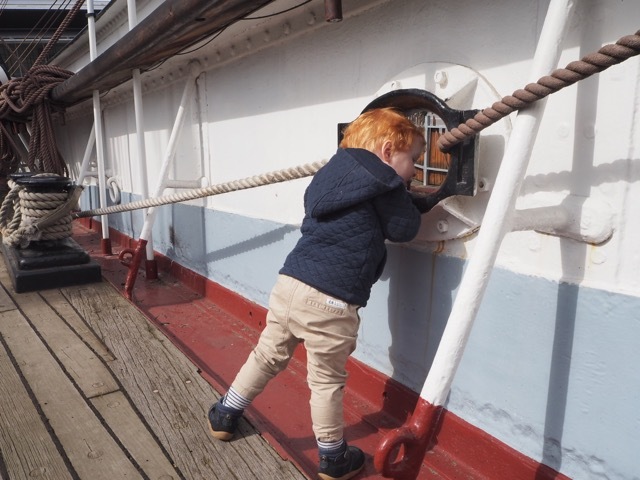 They enjoyed exploring the beautiful tall ship and taking part in the special activities. Thanks again National Trust Australia (Victoria) for having us and thank you Kate for the fab review and pics! Located in the heart of Melbourne’s South Wharf precinct, the Polly Woodside is a tangible reminder of Australia’s rich maritime history. Built in Belfast in 1885, the Polly Woodside operated as a cargo vessel, travelling 1.5 million kilometres around the globe. She was ‘sold’ to the National Trust for one cent in 1968 and after a decade of restoration it was opened to the public in 1978 at the Duke’s and Orr’s Dry Dock. 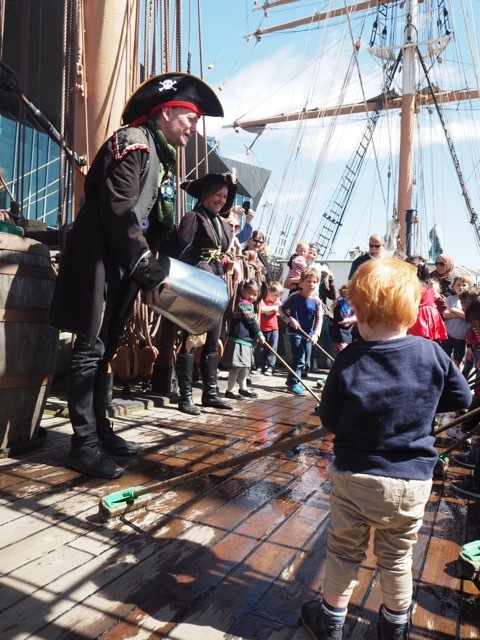 X marks the spot at Polly Woodside on the first Sunday of each month with Pirate Sundays! 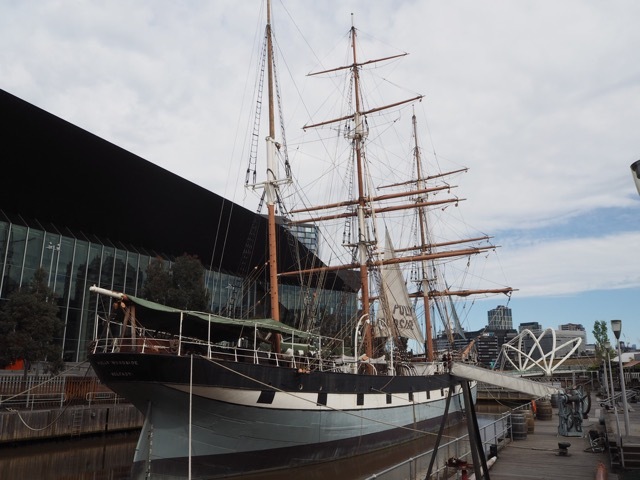 Having not visited the Polly Woodside before, we were delighted to be invited by the National Trust of Australia (Victoria) for a day of adventures on board this historical vessel. After admiring the stunning tall ship from a far (including the 10 story high main mast), the poppets were very eager to board and start exploring. We were greeted with an “ahoy there, mateys” from the pirate staff and invited to come aboard before the first scheduled activity commenced at 10:45 am. We had about ten minutes to roam the decks before we heard a loud bell ringing and were instructed by the pirates to abandon the ship! Once everyone had made it off safely (phew!) 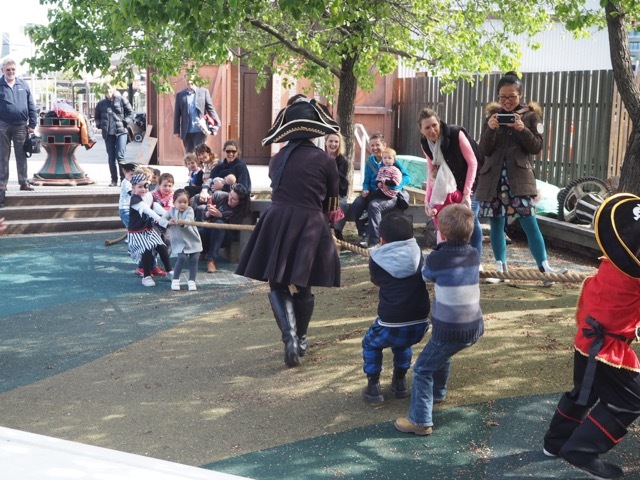 and over to the adjacent playground, the pirates organised a game of tug o’ war. It was super cute watching the little ones (many of whom had come in pirate dress) line up and compete to be the strongest side. Although in true pirate form, a few naughty cheating tactics were implored to determine a winning side! You have to watch those cheeky pirates! We were then instructed back aboard Polly to search for treasure. Each child was able to collect three gold coins and return them to a metal bucket before going in search for another three. What excitement there was! Once all the treasure was found on the decks, the pirates discovered more coins hidden (strategically planted) in shoes, under caps and in pockets, much to the delight of the children. For all their efforts, the little scallywags were given two pieces of treasure to take home as a souvenir, Arlo quickly put his loot in his pocket away from Macy who was already trying to sneak more out of the bucket! Below the decks, we discovered what life onboard was like in the 1800’s, including a visit to the captains quarters. The poppets helped search for rats (thankfully the squeaky toy variety) and while Macy had her first face painting experience (a super sweet pink flower painted on her hand), Arlo enjoyed colouring in the pirate themed colouring sheets. Back up on deck, we ran from side-to-side to see if we could ‘rock the boat’ (yes we could!). 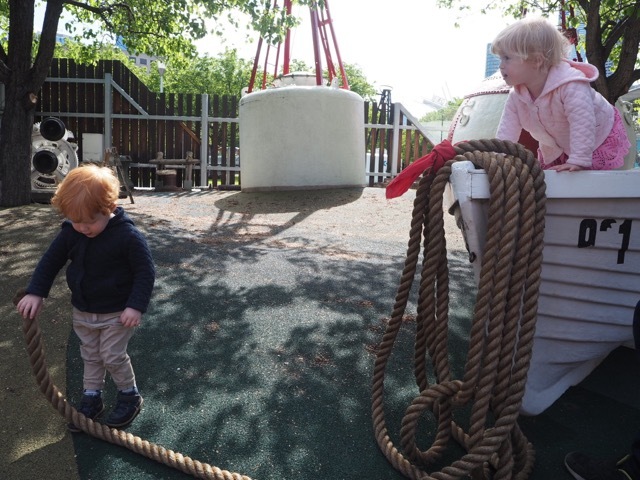 Arlo took great delight in helping to scrub the decks clean and Macy had several turns swinging on the rope. After a jam-packed two hours the morning session was complete (the afternoon session begins at 12:45pm) and we disembarked with treasure in our pockets, a few new pirate jokes to share with Grandma and Grandpa plus two toddlers who kept shouting ‘arrrr’ at people as we walked back to the car! Pirate Sundays offer an engaging experience for all of the family onboard the Polly Woodside. If you haven't already been, we highly recommend that you visit one of Melbourne’s most-loved iconic tourist attractions. * I was thrilled to read that the Victorian Government has just announced that the vessel will receive funding that will not only secure the future of the ship (supporting the many hours of volunteer labour put into its restoration and maintenance) but will also be used for conservation works, including urgent specific repairs. Yay! Arrive by 10:45 am to make the most of the scheduled morning activities. Prams are not allowed onboard but there is ample (undercover) pram parking available next to the main building. No food or drink is allowed onboard but you can go on and off the vessel as many times as you like. There is an undercover area with picnic tables in the outside area next to Polly where you can enjoy your own snacks or lunch. Keep a look out for helicopters taking off and landing from the nearby helipad. Polly Woodside is a unique and exiting venue for children’s birthday parties. 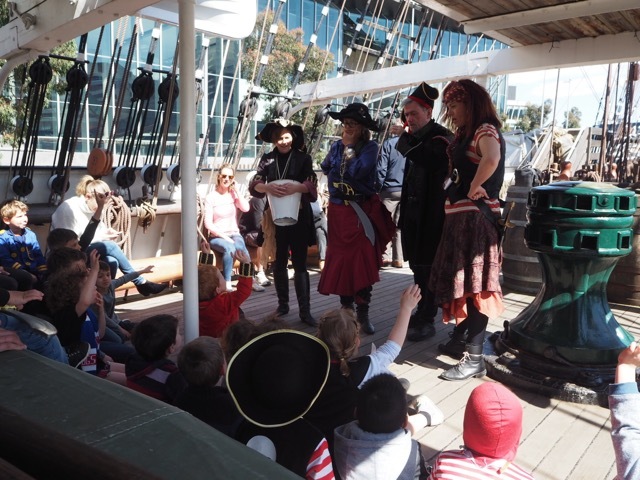 > For more information on Polly Woodside and Pirate Day, head to their website. > For more ideas of what to do with the kids in Melbourne, checkout our Daily Spots List, CBD Spots or Blog.